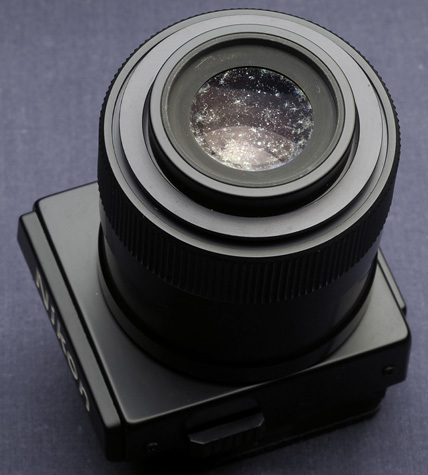 Older lenses have many ills mostly due to neglect and inappropriate storage. Here I attempt to list and describe the most common ones. One of the worst things that can happen to a lens is fungus infection. 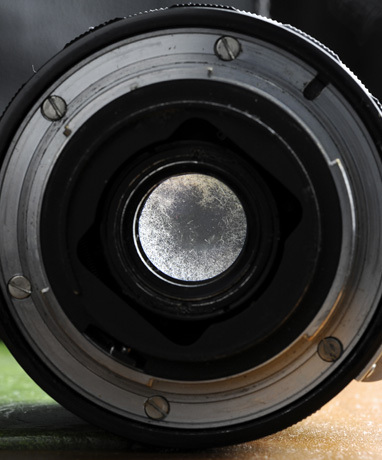 This occurs when the lens is stored in a dark, warm, humid environment for an extended period of time. There are many different kinds of fungus, but the ones I often encounter either resemble the root of a plant or fuzzy spots. This is a well advanced fungus infection on the rear element of a Minolta f/3.5 135mm MC Tele-ROKKOR lens. 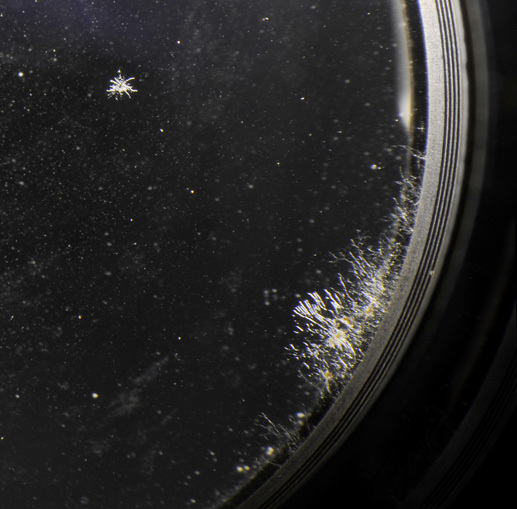 No, not a view from a space shuttle, but fungus growth deep inside the barrel of a 135 mm Nikkor lens. I am adding this paragraph about a year after I initially created this page. I have taken apart several of my used lenses and to my distress I found fungus in most of them. Even in lenses that looked clean before disassembly. I have now come to the conclusion, that it is more the rule, rather than the exception, that older lenses are infected with fungus. The extent of the infection varies, of course, but all one can hope for, I think, is that it is not too bad and the damage may be (fingers crossed) repairable. This Micro-NIKKOR lens is badly infected with fungus. Despite of its scary look, I was able to remove the fungus completely. 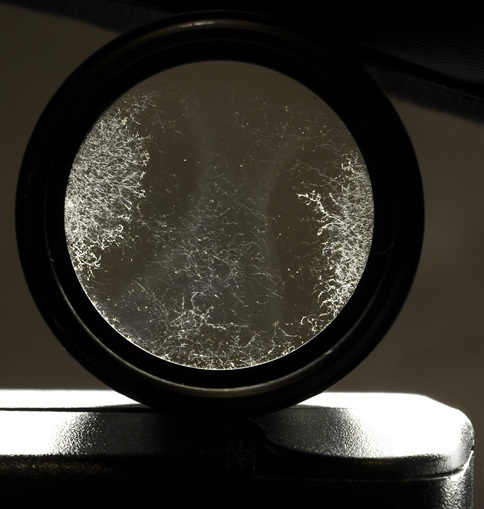 Patches of mould on a Nikon magnifying view finder. Although easily accessible, fungus like this will not clean off completely. The best strategy is, of course, prevention. 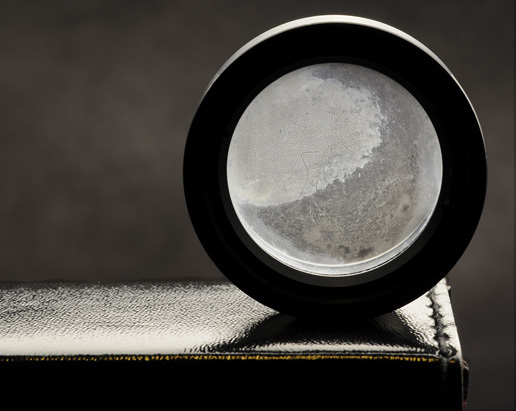 If the lens is not used often, try to keep it in a well lit, dry place with the lens cap off. Put a filter on the lens instead, to protect it from dust. Exercise the lens from time-to-time. The more expensive solution is to keep the lens in a dry cabinet (also called dehumidifying cabinet). I have one, and it seems to work well. The manufacturer recommends a humidity setting of 40% - 50%. At the place I now live 75% plus is quite common, so my investment should pay off. If you find an infected lens, keep it separate from the rest of them. Fog is perhaps the worst enemy of lenses, because it is irreversible. Nothing I tried worked and I don't know of any successful attempt to remove it. It often seems as though the cloudiness was inside the glass, because it just won't rub off. I am not sure what causes fog, but one possibility would be the evaporating moisture or grease which settles down on the glass. In the dark days of ignorance I used to try to get rid of fungus by putting my lenses out in the sun. UV light does kill the fungus (although only near the surface, because glass absorbs the UV rays), but the heat melts the lubricants and that creates other problems - including fog. The fogging of the inside surface of the rear lens element of this Tamron f/6.3 400mm telefocus lens looks pretty scary when illuminated with a strong light source at a sharp angle. The fog can spread over the lens evenly or can be patchy, as on the picture above. If the fog is light, the lens can still be used, although contrast will be weaker. (It might even provide a pleasing effect on some portraits.) Generally, however, it is best not to spend money on a foggy lens.